So I was expecting a kind of manhua version of Non Non Biyori, or Laid Back Camp; a comic that immerses you in the wonders of the outdoors through beautiful artwork, and leaves you feeling serene and somehow, purified. Uncomfortably Happily is that, to a certain extent, but there’s a lot more going on here. It’s also about the dangers (both physical and psychological) of trying to earn your daily bread as an artist, and the difficulty of living in the moment even when you’re trying your absolute damndest to do so. Hong’s style is well-suited to the material. 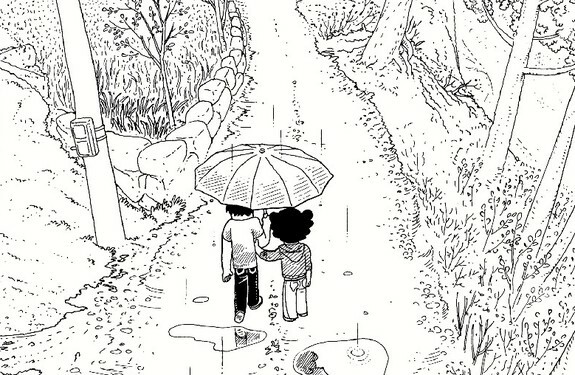 While the characters are very cartoony (and quite adorable), the backgrounds are elegant; detailed, yet not fussy or over-rendered. The story covers the change of several seasons, and through Hong’s linework, you can very nearly feel the change in the temperature on your skin. When the trees are all covered in snow and Hong and his wife huddle around their little charcoal stove, you can feel that warmth, that inviting coziness, so effortlessly. At some points the art loses its detail work and becomes very stark, but always in the service of creating powerful images that communicate the characters’ inner lives better than any dialogue could. This is an autobiographical comic and it feels like it, filled with tons of little details that would probably only occur to someone who had lived in this exact scenario. I’m always a little hesitant to use the term “autobiography” in regard to comics, because a lot of so-called autobiographical comics that I’ve read feature a lot of fiction weaved in with the real-life remembrances (and there isn’t anything wrong with that, necessarily, but it does make me wonder if the term “semi-autobiographical” isn’t a safer designation.) 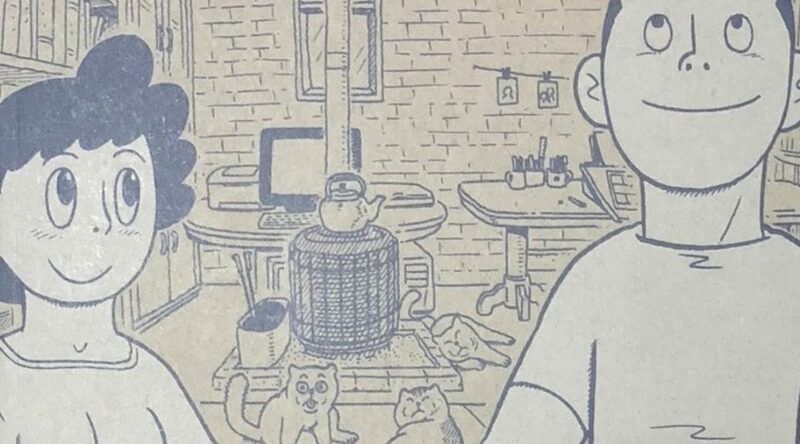 I have no idea how much of this comic was drawn directly from Hong’s experience, and how much might have been exaggerated for drama, but regardless, it feels real; it feels like a glimpse into a year or so of someone’s life, disappointments and all. Sometimes I think about retreating to some rural cottage somewhere, breathing clean air and going swimming in a crystal-clear stream every morning. It’s a nice idea, but for some reason, I think I’d always assumed that in that venue, my problems would just disappear, and Uncomfortably Happily shows all the reasons why natural beauty, as wonderful as it is, is not a cure-all for your problems. In fact, sometimes it felt a little uncomfortable to read this book, since the gap between the pastoral paradise Hong wants and the reality of his life is so jarring, it made me conscious of how unrealistic my own fantasies were. Nevertheless, nature can be a cure for what ails you, but it’s not going to do the work all by itself; you need to meet nature halfway, by being at peace with yourself (or close enough to it) that you can actually take in the wonder of what you’re surrounded by with clear eyes. 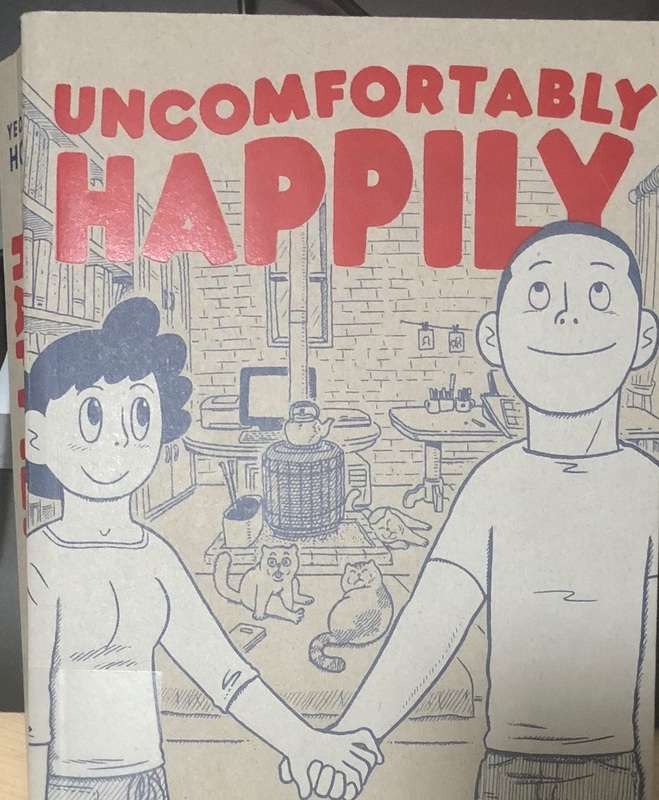 Uncomfortably Happily is $29.95, published by Drawn and Quarterly. Originally published in two volumes in Korea, this thick edition has the complete story. The paperback edition isn’t as robust as I would like; after one reading, the spine already looks pretty worn. Nevertheless, it’s an attractive looking book and deserves a place on your graphic novel shelf. And if you don’t have a graphic novel shelf, for some strange reason, you can always just put it on your regular bookshelf (preferably next to Henry David Thoreau’s Walden), and call it a day.